May 2, 2018 - On a mission to continuously improve machine efficiency, John Deere is excited to announce the integration of Waratah’s TimberRite H-16 Control System on John Deere tracked harvesters and tracked swing machines equipped with Waratah 600-Series Harvesting Heads. Previously only available for the 200- and 400-Series Waratah heads, this productive and efficient system has been expanded for use with the 600-Series heads, providing loggers with a solution that enhances connectivity for data and information sharing. With the addition of the H-16 Control System, operators have more control of harvesting and processing heads, increasing precision when measuring and cutting timber. One of the most notable features on the system is the ability to configure settings to exact application needs, improving head performance, productivity and measuring accuracy. Loggers can choose from two systems based on their needs. The preselection prioritization system follows preset logic and prioritizes based on operator selection, length and diameter, while the optional value-based optimization system uses log grade, assortment value, stem prognosis, length and diameters matrices, and demand inputs. 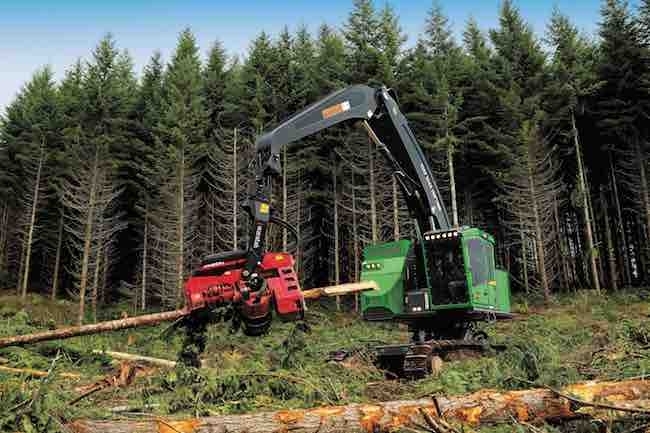 Using the H-16 Control System, loggers have technology at their fingertips. The user-friendly platform makes it easier to check work and repair statistics, track navigation and monitor machine data. Supporting StanForD file format, the TimberRite H-16 system allows data to interchange with virtually any professional system in the forestry business. The H-16 Control System is even more beneficial when integrated with JDLink, providing loggers with connectivity with access to production data, including average tree stem size, actual production, work time utilization, productivity and fuel consumption. Additionally, the John Deere telematics permit remote display access for troubleshooting the TimberRite H-16 system, and wireless data transfer enables automatic file sharing through JDLink, even in remote locations. Now five years in base, JDLink is the John Deere telematics equipment management solution system that connects owners and managers to their machines and dealers. JDLink provides alerts and status updates to help owners and managers better manage where and how equipment is used. The H-16 Control System can be installed at the factory or aftermarket through a John Deere dealer. To learn more about the H-16 Control System, the John Deere harvester and swing machine offerings, and JDLink, visit www.johndeere.com or contact your local John Deere dealer.